DynRPG 사용시 세이브를 하는 경우 함께 생성되는 Save##.dyn 파일을 게임 종료시 함께 지워주는 플러그인입니다. 다만, 일부 플러그인의 경우 이 Save##.dyn 파일에 플러그인 구동과 관련해서 추가 데이터를 저장하므로 작업 중인 프로젝트에서 문제가 없을 경우에만 이 플러그인을 사용하시길 권장힙니다. DynRPG가 설치된 프로젝트에서만 구동 가능하며, DynPlugins 폴더 안에 해당 플러그인의 dll 파일이 들어 있습니다. 위 링크를 통해 배포페이지에서 해당 플러그인의 데모 파일을 다운로드 받을 수 있습니다. DynRPG에 대한 내용은 "습작의 스크립트 이야기 : 번외편 - 7편 : DynRPG(http://avangs.info/1031048)"를 참고해주세요. 해당 플러그인의 자세한 사용법에 대한 내용은 리드미를 참고하세요. install a new plugin, and load your save again, it will just show a black screen and hang. isn't a plugin that uses them yet. higher than that (don't know why you would need to...) then you'll need to alter the source. 1. Copy the "save_cleanup.dll"into the DynPlugins folder of your own project. 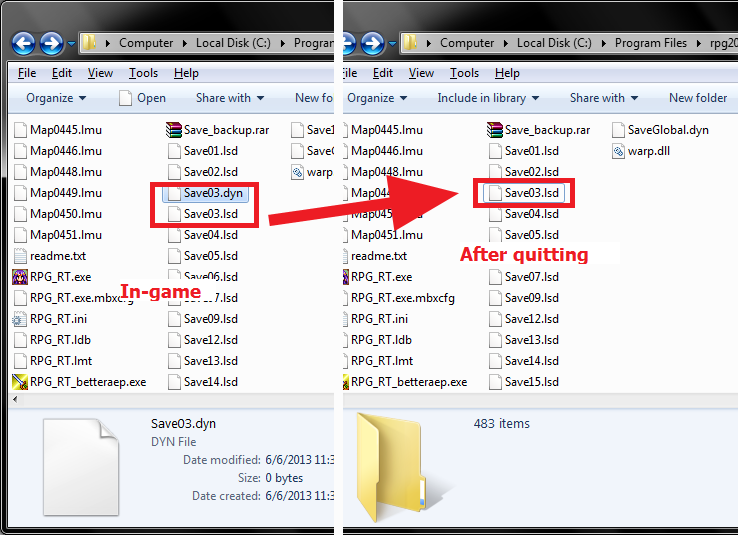 Save the game, and while the game is still open, observe that a "Save##.dyn" file was created by DynRPG.